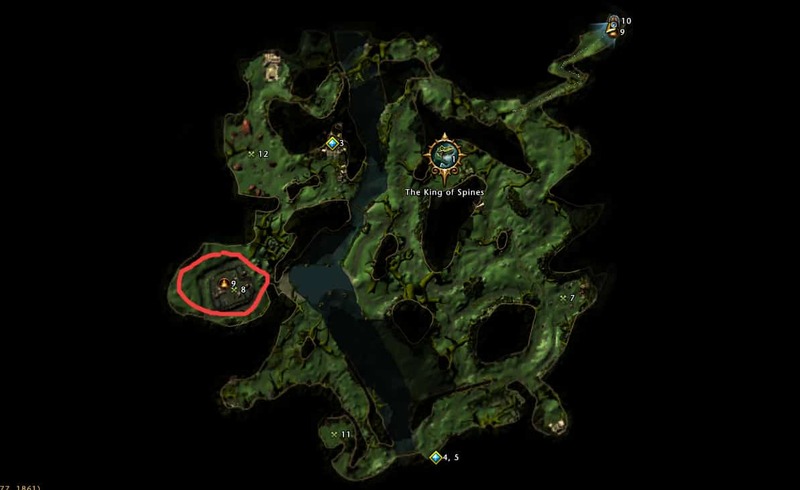 Refinement Guide for Neverwinter - Farm RP and refine your gear fast! Welcome to our Refinement Guide! The Refinement system in Neverwinter got a much-needed update in module 12b. It is now much faster to refine gear, artifacts, and enchantments. The x2 enchantment events are now gone, but refining is double as fast all the time. You also no longer have to feed artifacts to other artifacts, and the cost of refining enchantments are much lower. All you have to do is farm or buy refinement and get going! In this guide, I will show you the best tips on how to refine your gear fast and farm refinement. If you learn the ropes of real Astral Diamond making, farming AD is actually a lot faster than farming RP. See our Astral Diamond guide for more info on this. Always have Dragon’s Hoard / Fey Blessing / Quartermaster’s Enchantments on your utility slots. I also have Makos’ Signet equipped for an extra utility slot when farming. So my set up is x3 Dragon’s Hoard, x2 Quartermaster’s, 1x Fey Blessing. Consider wearing these even after you’ve refined all you’re gear, as you can now use RP to earn AD. Bags from Quartermaster’s Enchants should be saved for x2 enchantment events. Have a mount with Wanderer’s Fortune. This has a cooldown though so when you see that the Wanderer’s Fortune Proc is going off, but you’re not getting items, you can unequip it if you want. Invoke the gods when you can for some extra refinement items. Most enchantments are still cheaper to just buy on the AH and sell the old one you have instead of refining it yourself. When buying refinement off the AH, calculate how much you are paying for each point. For example, an Emerald is 550 AD on the AH on PC right now, it provides 250 refinement. 550 / 250 = 2.2. So you are paying 2.2 AD per refinement which is quite good. Identify and refine all rare and uncommon gear. Refining and identifying is quick through the Refinement Menu accessed through the gear icon in your inventory. Bonus refinement events come by from time to time, so check your calendar. Mobs you kill during the event will have a chance to drop Refinement, and you can pay to increase the amount of RP they drop. The best way I have found to rack up RP during the event is to run dungeons. 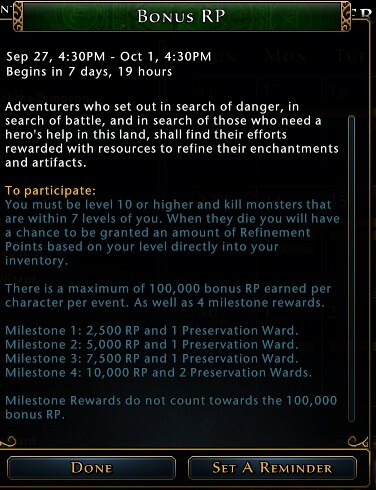 There is a cap of 100k RP for the event and when you hit certain milestones you get more refinement as rewards to a total of 125k RP and 5 Preservation wards for the entire event. The best way to farm RP, is generally by just doing the content you usually do with enchantments and Wanderer’s Fortune. But there are a couple of spots that you can farm for additional RP. At level 70 you start earning overflow experience which can reward you with some nice rewards like AD, XP Tomes, Power Points, and Refinement. You will earn Overflow XP just like you earn normal XP so all content will reward you with Overflow XP. There is, however, a spot that you can farm for Overflow XP and make a decent chunk of Refinement. This method will require that you have high DPS and decent survivability. Doing this during XP events works bests. Around Camp Vengeance in Soshenstar River, there are a whole bunch of Rotting Ogre mobs, along with a lot of other undead. Kill everything in a circle around the camp. These Ogres reward you with a lot of XP and just a few runs will give you a level of overflow XP. Remember to pick up all green equipment and gems for extra RP. When you have killed all the Ogres in a zone, change map to a new map. Always choose the map with the lowest amount of players to make sure no one else is there competing with you. These start every hour at quarter to the hour (12:45, 13:45, etc). Go to the Well of Dragons and watch the chat for what instance number the run is happening it and switch to that instance or ask for an invite if it is full. After the 5 dragons are killed in one instance, move to the next one and you will usually be able to kill all 5 there as well. Daily quests in Dread Ring offer some great rewards. The daily lair quest from Sergeant Knox can even reward you with Superior Enchanting Stones. Be sure to forge the Adamantine Gauntlet for extra rewards. More lair keys can be bought through the Dread Ring campaign store with Vanguard Scrips. Vanguard Scrips can be bought from the Bounty Master in Dread Ring for Onyx Fragments which can be bought off the AH or farmed from Dread Ring mobs. Meaning you can farm the lairs more than once a day. You need 50 Onyx Fragments to buy 10 Vanguard Scrips for one key. Sharandar quests also offer great RP rewards. Complete 3 quests in each of the three areas, and earn an emerald from each. Sharandar mobs are also very weak so killing the mobs here are really quick. Each area also has one lair. You will get a free key to the chest at the end of it from the Leprechaun but can buy more from him for 10 Gold Crescent. Gold Crescents can be bought for Fomorian Concoctions at the Bounty Master, and Fomorian Concoctions can be farmed or bought off the AH. That’s it for refinement point farming. If you have any tips for our refinement guide, let us know in the comments below! Thank you very much for posting this guide.This is very helpful to me since when I first started playing this game I have no clue what my character need. WTF! at no point in the guide do you actually state how refinement works. Isn’t that the meaning of the word “Guide”? “Refining is also quick through the Refinement menu” ? How, where ??? FYI: Refinement is the end-game if you want to get your enchantments leveled up. Leveling up your enchantments is how you get that total item level to be greater than 12000, which is what is required for the latest modules.